Today is my last day in the office until January 2, 2013. In clearing my desk, I ran across this lovely note I've been holding onto from an author expressing gratitude for a response, even though a rejection, to her query. With electronic submissions, it's increasingly difficult to keep up, not only with reading, but also with responding to queries. Our agency receives about 500 submissions per week. It's our intention to respond to every query, but it has become nearly impossible to do so. There was a time when I was submitting my work to agencies, but not necessarily tracking responses. I remember getting a rejection from this very agency months and months later and being happy that my work was still circulating. The phenomenon of not receiving a response to a query has quickly become standard practice for some agencies, the idea being, if you don't hear, you can assume it's a rejection. This is not our policy, as of yet, but again, we are struggling to keep up. Don't think you are alone, though. Many of the queries we send out on behalf of our clients to editors go unanswered. Kimberley says this didn't used to be the case. Editors are also struggling to keep up with the volume of electronic submissions. I want to thank and show my appreciation for the author above for her kind note. 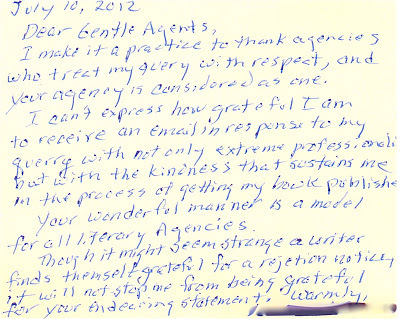 A note like this--when the pace of our world has increased, chaos reigns and publishing seems impersonal--reminds me how important it is to stop, value and foster (to the best of my ability) the creative spirit of all those submitting to this agency. I have much to do. As a literary agent, I am constantly reading and considering, sending manuscripts with thoughtful intent, and frankly, just trying to publish every writer I deem worthy. I do not need people following me - I have too many emails now that I can't possibly address - guilt is one of those things that I have learned to live with. This is the New World - I get it, but I'm not happy that I can't personally answer all the queries I receive. Please keep trying, and if you don't receive a timely response, send your query again. It's our responsibility to read and review your work, professionally. We try to do our best. Good work will always rise to the top - no question about it. Keep going and know that we are there to help. I wish you the happiest of the holiday season. 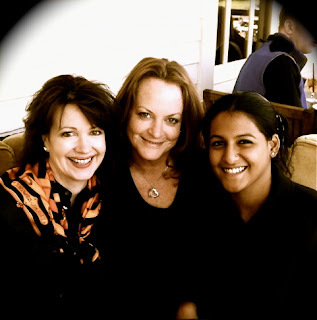 Three KC&A Book Deals Announced! Kimberley and I are excited to announce that we have finalized three book deals this week! Kimberley sold her client Doug Burgess's THE FIRE GODS: IMAGINING EMPIRE IN THE AGE OF STEAM, which documents the development of the steam engine with regards to the annihilation of space, and suggests that as the motivating force behind imperialism, the steam engine was among the most destructive forces of the nineteenth century, to Elizabeth Demers at Potomac Books, for publication in Spring 2014. Art Kerns’s debut THE RIVIERA CONTRACT, in which a retired FBI agent/CIA contractor accepts a “low risk” assignment in the Cote d’Azur and finds himself in a tangle with U.S. and French Intelligence and the target of a terrorist trifecta, each with its own agenda, to Mary Cummings at Diversion Books, for publication in Spring 2013. Garrett Calcaterra’s DREAMWIELDER, in which a young girl with supernatural abilities and of royal blood embarks on an epic journey to harness her power and free an empire from tyranny and the war against magic, to Mary Cummings at Diversion Books, for publication in Spring 2013. Award winning author of the Tom Hickey California crime novels, Ken Kulken, gave a quote for Matt Coyle's YESTERDAY'S ECHO (Oceanview Publishing). 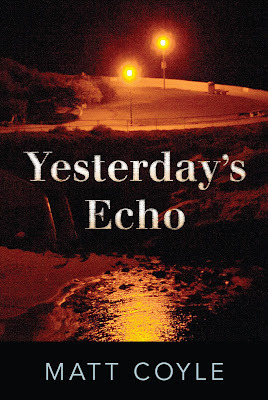 "Anyone who wishes, as I do, that Raymond Chandler had written more novels ought to read Matt Coyle's YESTERDAY'S ECHO, which zings with wit while it convinces us that police, politicos, and business folk can be as mean and corrupt as ever." Kimberley was recently interviewed by Marin Magazine for an article titled, "The New Art of Publishing." 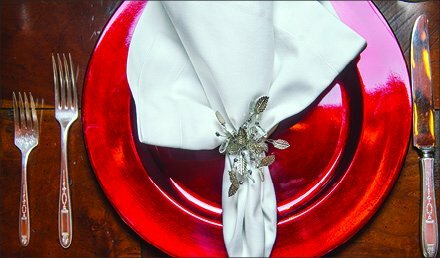 Follow the link, scroll to page 58 and enjoy! Below is a link to photos taken by Ted Weinstein at the Books & Booze cocktail party held at Chronicle Books earlier this month. Take a look; you just may see some faces you recognize in the bunch. 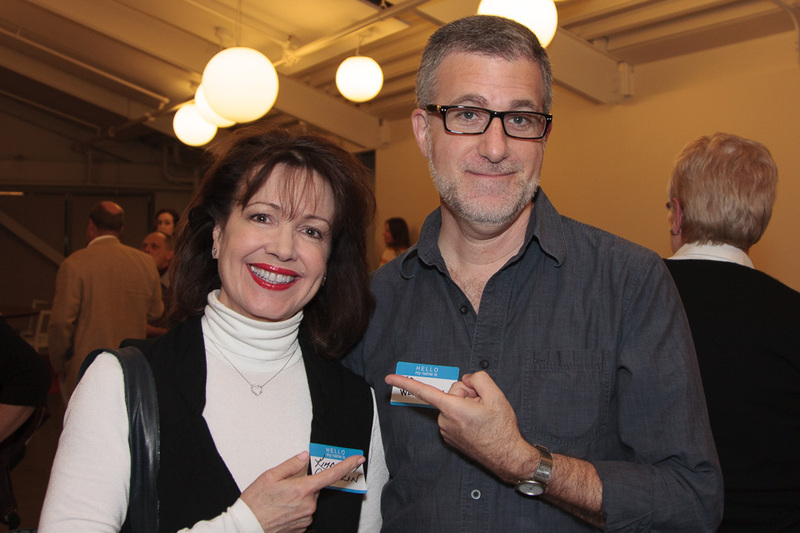 Kimberley Cameron & Associates was well represented at the event. I believe there were eight of us who attended the event, three agents and five readers. We are very excited to announce that D.P. Lyle's book RUN TO GROUND (Oceanview Publishing) was a 2012 USA Best Book Award Finalist in the Thriller/Adventure Category. 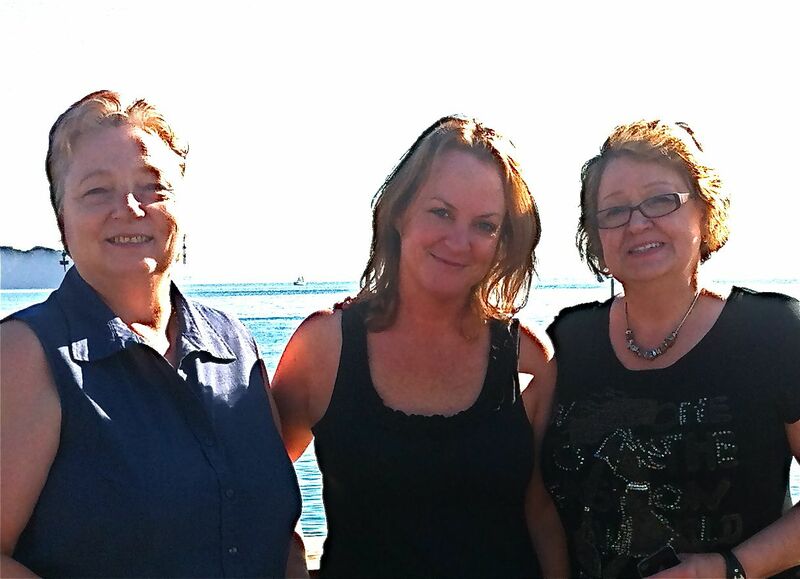 Canadian writers Dana Ramstedt (left) and Fern Hinse (right) with agent Elizabeth Kracht in Tiburon. At last year's Surrey International Writers' Conference (SiWC), they held an auction to raise money for the conference. Beforehand, the organizers asked me if I had anything to contribute, like books our agency had sold. I knew I didn't want to cart books with me from California, but tried to think of something else that might be helpful and of interest to writers. Before I became a literary agent, I thought of myself as a writer. In fact, I got closer to the industry to figure out how to get published. One of the biggest eye openers for me as a writer, was interning at Kimberley Cameron & Associates. After reading through hundreds of submissions over that six-month period, certain, almost template, patterns emerged; every manuscript had its Achilles heel, however small. Most inspiring to me, was having the opportunity and perspective to see those template mistakes. This opportunity is a real gift to any writer, I thought. I asked Kimberley if we could auction off a three-day internship at the agency and she said yes. Traveling from Canada to California for a three-day internship is no small undertaking, so I wasn't sure if it would be of interest. But after the conference, I soon received an e-mail putting me in touch with Dana Ramstedt, who won the internship and was eager to begin making arrangements to come and read for us. Nearly a year to the date she won the auction, Dana has not only put in her three days, but also brought a writer from her critique group along with her, Fern Hinse, who has also been reading for us. In these three days they've had a peek at the inner workings of a literary agency, from reading submissions and sending those rejection letters no writer wants to give (much less get), to overhearing conversations between agents, editors, and writers, and getting feedback on their own work. They also had to listen to me grumble a couple times. It has been a real pleasure and honor to have Dana and Fern with us, and we are very grateful for their help in reading submissions as well as the other contributions they made while interning for us. 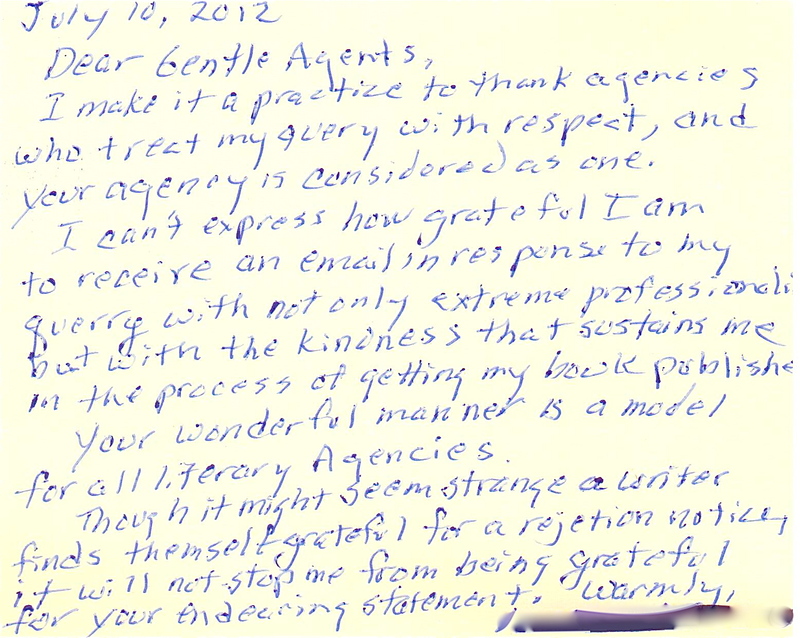 I'm hoping to get one of them to contribute a guest blog on their experience at the agency! As a side note, if you're looking for a great conference to attend, the SiWC is a warm, fun community of writers, and one of the best conferences I've had the good fortune of attending. It has been a great summer at KC & A - I attended the Paris Writer's Conference and made lots of deals over the recent months, launching the careers of many new authors. The industry is healthy and books are not going away! I'm pleased to announce that KC&A is expanding to include some new young (er:-) agents, ready to find new voices. Two of our interns, Ethan Vaughan and Pooja Menon, have proved their excellent editorial and author interface talents, and we have decided that they are ready to start their own lists. Liz and I are still reading and considering new clients as well - and they will also add a younger and international viewpoint to the table. As they say in French, may your "rentrée" be a great one. Here's to a lovely fall! Below is a link to an interview I did with Brittany Roshelle Davis for Chuck Sambuchino's Writer's Digest blog. I was in a quirky frame of mind while completing the interview. I hope you enjoy it. The New York Journal of Books applauds D.P. Lyle's RUN TO GROUND, telling readers everywhere, "Don't miss this satisfying mystery written by a very talented writer." The chilling tale of child abduction and murder takes the reader on a nonstop ride: "The book has several great twists, concluding amidst a series of surprising, thrilling events." 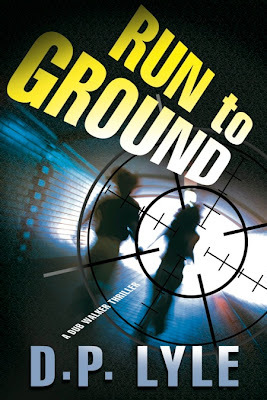 With suspense, a cast of compelling characters, and heartrending emotion "Run To Ground is a well written and thoughtful story, a tale many readers will easily become engrossed in." Be sure to grab your own copy of D.P. Lyle's RUN TO GROUND. Read the exciting review released today on NPR about author Laura Florand's THE CHOCOLATE THIEF! Featured as "a delectable summer bonbon," Florand's novel is described as a perfect book "for days when you lust not for wisdom, but for a bar of chocolate — at any price — and a hero who understands what is truly important." Read the review here, and be sure to check out Laura Florand's deliciously sweet read for yourself! Laura Florand is the author of THE CHOCOLATE THIEF and BLAME IT ON PARIS. Read a personal interview with Kimberley Cameron at the esteemed Author Salon. Important questions about her thoughts as a reader and agent are answered, giving valuable insight into the literary world of publishing. Read the interview here! More exciting news regarding author Laura Florand! THE CHOCOLATE THIEF was highlighted on Good Morning Texas Buy the Book segment yesterday in their "Summer Escapes, travels and tales" showcase. The romantic tale of a French chocolatier and the woman who wants to buy his business is the perfect addition to a summer reading list. The chocolate adoring author has been receiving praise from various papers and online publications for THE CHOCOLATE THIEF and BLAME IT ON PARIS. A recent interview with Laura Florand is also available to read here. Finally we get to know the amazing author personally and learn a few wise words: "I really think dark chocolate is an important part of any healthy diet." She talks about her inspiration and the experience of meeting with an actual chocolatier to research her novel THE CHOCOLATE THIEF. You can also read an article about Laura Florand published by the News Observer here, where the question is asked 'What do women want, anyway?' Laura is praised for answering these questions in her novel THE CHOCOLATE THIEF. Make sure to check out Laura Florand's memoir, BLAME IT ON PARIS, a "A frothy French confection" (Publisher's Weekly) and her novella "All's Fair in Love and Chocolate" found in the romantic anthology KISS THE BRIDE. 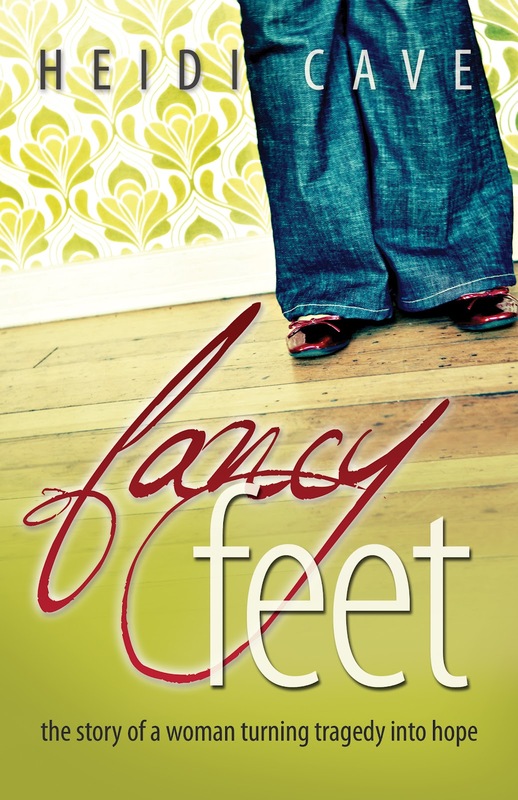 We are very excited to have Heidi Cave's FANCY FEET cover from Behler Publications. Isn't it beautiful? Heidi's friend provided the photograph, part of a series taken of Heidi's prosthetic legs/feet. Heidi lost her best friend Betty and both of her legs below the knee in a car accident caused by a reckless driver. She is also a burn survivor, having suffered burns over 50% of her body. Her story is a page-turner full of hope, triumph and giving back. I'm excited to announce that Laura Florand, author of THE CHOCOLATE THIEF, will be attending the Women's Fiction Festival in Matera, Italy before going on a book tour in the area. I'll be attending the conference as well--hope to see some of you there! We're excited to see some great support for D.P. Lyle's RUN TO GROUND! Susan Wasson, a veteran at Bookworks in Albuquerque, writes, "I could not turn the pages fast enough while reading RUN TO GROUND. All the characters were so real." Mystery Gazette writer Harriet Klausner also wrote about RUN TO GROUND in a blog post, which can be found here. The International Thriller Writer's third anthology, THRILLER 3: LOVE IS MURDER, was released at the end of May. Among the host of great stories represented in the anthology is D.P. Lyle's short story EVEN STEVEN. I sold my client Jim Satterfield's thriller SAVING LAURA to Oceanview Publishing today for publication in ebook and hard cover in 2013. Very excited! Jim is a master at writing setting, and a true pleasure to work with. Jim's novel THE RIVER'S SONG is also due for publication in 2013 through Avalon, which was just taken over by Amazon (as many of you probably know). This is just the beginning for Jim. He's currently revising his next work, a historical fiction based on the story of Sitting Bull, and is also shopping a YA manuscript. Publishers Marketplace announced Kimberley's most recent deal on June 29th. 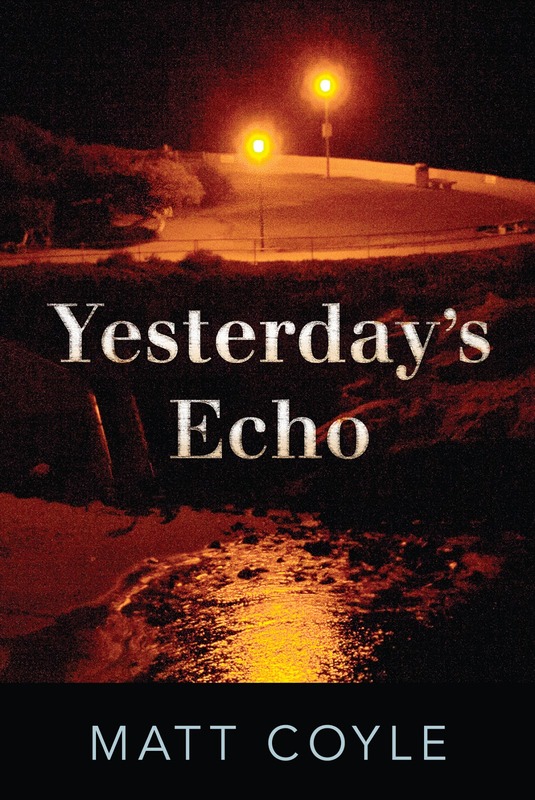 She sold Matt Coyle's YESTERDAY'S ECHO to Bob and Pat Gussin at Oceanview for publication in 2013. YESTERDAY'S ECHO is about a disgraced ex-cop, branded a murderer but never convicted, who grasps at a chance for redemption by risking his job, freedom and life to save the woman he loves. Congratulations Matt, Kimberley and Oceanview! D.P. Lyle's recently released book RUN TO GROUND received a short but sweet review from Bestsellersworld.com. "This book is a page-turner from beginning to end." "Call me morbidly curious, but I found the book vastly entertaining aside from my perspective as a writer. Even if you're not the author of crime, mystery, or thriller novels, you'll be fascinated by the tremendous amount of information and varying perspectives Lyle offers his readers." To read Linda Faulkner's full review, click here. I was very excited to get an e-mail this morning from our former intern Alex Webb saying that he and Mallory Bass, another former Kimberley Cameron & Associates intern, are engaged! Alex and Mallory met at the agency and were both MFA students at St. Mary's. Alex is a talented writer, whose manuscript I'm reading, and Mallory a talented poet, whose collection I someday hope to see. Both have helped us tremendously with client manuscripts. We thought Alex and Mallory might get married. At our Christmas party last year, Alex made an early comment about marrying Mallory after they disclosed to us they'd been dating for a while. They were trying to keep their dating on the down low, but we had our suspicions. They didn't realize how much we love a good love story. When I gave Kimberley the news today that Alex and Mallory are engaged, she was thrilled. 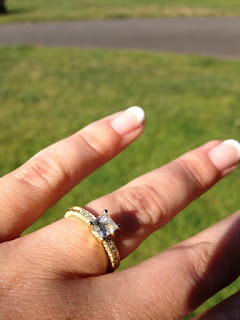 She said, "If you do nothing else today, at least put up a blog about their engagement." Done. It's an honor. Congratulations to you both, Alex and Mallory. We love you and wish you the brightest and happiest future together. We are so excited to have played a small part in your union, and hope you will keep us posted on life as you go forward together. May 30th was a special day. My sister called me yesterday to say she got engaged last night as well! Kimberley has worked extremely hard these last few months, making deals in this tough publishing climate. I thought I'd list her most recent deals so you can see which publishing houses she's been working with and what projects she has sold. Jane Shoup's THE CHRONICLES OF AZULLAND, the story of a woman who embarks on a quest to save herself and her people in the midst of lustful dark gods, power-thirsty kings, and a forest of white magic, to Mary Cummings at Diversion Books. Susan Shea's THE KING'S JAR and MIXED UP WITH MURDER, the next two in the Dani O'Rourke mystery series, set among museums and the super wealthy, to Alex Lubertozzi at Top Five Books. Philip Donlay's ZERO SEPARATION, the next of the Donovan Nash thrillers, about a race to stay one step ahead of a blackmailing FBI agent while trying to stop a terrorist bent on the death of millions, to Robert and Pat Gussin at Oceanview. Terri Nolan's BAD PACKAGE, in which a young journalist inadvertently becomes a part of the story when she investigates the questionable death of the man she loves and learns that he possessed vital evidence to a famous cold case murder that has been the obsession of her career, to Terri Bischoff at Midnight Ink. We are excited to announce that author Stan Goldberg has won the 2012 International Book Award (IBA) in the category of Nonfiction Health: Death & Dying for his book LEANING INTO SHARP POINTS: PRACTICAL GUIDANCE AND NURTURING SUPPORT FOR CAREGIVERS (New World Library). Stan has received outstanding reviews and endorsements for this important work. To see the full list of reviews Stan's book has received, please visit his website by clicking here. To see other IBA winners, click here. Literary Paris.... I'm off to Paris for a few months, and have been invited to attend the Paris Writer's Workshop at the end of June. We continue to explore new publishing ventures and have been making lots of deals for our clients. April was a sad month, personally, as my son's best friend was killed in a sailboat racing accident. She was a wonderful young woman in her twenties, with the future in front of her. Life is short, tenuous and precious, and we must remind ourselves to value those we love everyday. If I missed your emails, please resend, as this tragedy delayed my response for a few weeks. Be well, enjoy the sunshine, and keep believing in yourself and your writing. We will encourage and help you as much as possible. I'll be up and running in Paris over the summer! As part of the Idaho Writers & Readers Rendezvous, a conference in Boise that I'll be heading to tomorrow, editors Michelle Richter (St. Martin's) and Meghan Stevenson (Penguin) will be doing a live interview on RadioBoise.org from 12 p.m. to 1 p.m. MT. Tune in if you get the opportunity. If you miss the interview, it will be posted here after the show. I'm looking forward to seeing Michelle and Meghan, and meeting with the many writers in attendance! My client, Arthur Kerns, whose book THE RIVIERA CONTRACT I am currently shopping, will be a guest speaker at the monthly meeting of the Society of Southwestern Authors on May 5th at 10:30 a.m. The meeting will be held at 207 W. Clarendon Avenue, in Phoenix. Arthur's talk will focus on how to write about the FBI, CIA and State Department with accuracy. The corporate cultures of these agencies can be very different. Kerns will offer examples through personal experience and historical reference to help writers of suspense thrillers craft believable characters and dynamics between agencies. On May 9th at 11:30 a.m. Arthur will offer a talk in Scottsdale, AZ at the McCormick Ranch Golf Course titled "The FBI's Foreign Intelligence Operations During WWII." To reserve a spot for this talk, email simone@afioaz.org. Arthur will also be speaking at this year's Book Passage Mystery Writers Conference in Corte Madera. We will keep you posted on the details for this event. Arthur's career in the FBI included counterintelligence and terrorism. After he retired from the FBI, he became a consultant with the Director of Central Intelligence and the Department of State. Arthur reviews books for The Washington Independent Review of Books and is currently working on the sequel to THE RIVIERA CONTRACT. Never underestimate the intelligence of your audience! Do your homework and make sure you are writing with authenticity and accuracy, regardless of subject. For more information on Arthur Kerns, click here. 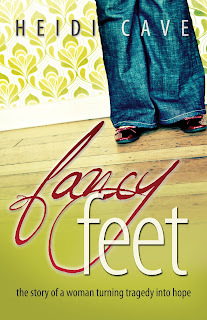 The PNWA Conference website shared that Lynn at Behler Publications acquired my client Heidi Cave's memoir FANCY FEET. Lynn met Heidi at the PNWA Conference, but I met her a few months later at the Surrey International Writers' Conference. There is a little blurb on the website from Lynn, but take a look at the video as well. The video shows how supportive these conferences are to writers. Click here to see Lynn's blurb and the PNWA video. I'll be attending the PNWA Conference again this year, held in Seattle. I signed three clients from the conference last year, and I'm hoping to find more great talent this year. BONJOUR MES AMIES... I was honored to be with several clients at the Left Coast Crime Mystery Conference in Sacramento, California a few weekends ago. I've always liked this conference, as it is smaller and more intimate than the very large ones. I spent time with old and new clients, and was pleased to have made a 3 book deal for a debut author by the name of Terri Nolan the week before - we celebrated big time! Kelli Stanley was nominated for the Golden Nugget Award, given to the author of The Best Mystery set in California. We were thrilled that she was nominated for her 2nd Miranda Corbie series, CITY OF SECRETS, but knew she was up against some formidable talent such as Sue Grafton and Michael Connelly. When her name was read as the winner, we were astounded and ecstatic. She deserves it more than ever, especially at this time in her life, and I could not have been more proud of her - congratulations Kelli! Your light is shining!!!! I'm looking forward to the Truckee Meadows Community College Writers' Conference on April 14th. My BFF is visiting from London and we plan to make a trip of it, stopping in Tahoe for a couple days before the business of writing commences. To check out the conference schedule and website, click here. My client Heidi Cave's memoir FANCY FEET: HOW I LOST MY LIMBS AND GAINED A LIFE has been sold to Lynn at Behler Publications. We are very excited to be working with Lynn at Behler. Heidi suffered a horrible car accident in 1998 when her car was struck by a reckless driver traveling at high speeds. She spent two weeks in a coma, seven months in the hospital burn unit and five months in rehabilitation. Heidi endured countless surgeries. She also lost her best friend in the accident. Today Heidi is a wife, the mother of two children, and a motivational speaker. She says "the tragedy of the accident has been turned into a life message of hope" and that she knows how to impart the power of love and courage to other survivors and their loved ones. I was fortunate to meet Heidi in person at the Surrey International Writers Conference. Her positive spirit made a lasting impression on me. It wasn't long before her prose did the same. I'm very much looking forward to many happy years with Heidi, and to working toward publication with both Heidi and Lynn at Behler. To visit Heidi's website and blog, click here. Her story is a true inspiration. Here are a couple memorable quotes uttered by reader J. Fischer (this may or may not be his real name). 1. "Just write me an OK sentence, somebody." 2. "Maybe the chocolate has me resonating with the angels." Author: Oh, this is cute, and hasn't been done before. J. Fischer: No, it just hasn't been published before. D.P. Lyle's book MORE FORENSICS AND FICTION received a review from website In Reference To Murder. The review says, "The book and its predecessors are terrific reference books to have on hand if you're planning out and/or in the midst of writing a mystery or thriller." 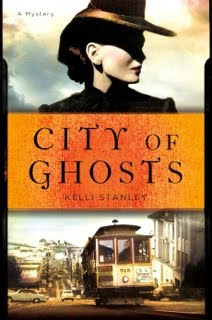 Just thought we'd share the cover of Kelli Stanley's book CITY OF GHOSTS, due out soon through Minotaur. A short story by Kelli Stanley is featured in an anthology just released by Down & Out Books titled SCOUNDRELS: TALES OF GREED, MURDER AND FINANCIAL CRIMES. 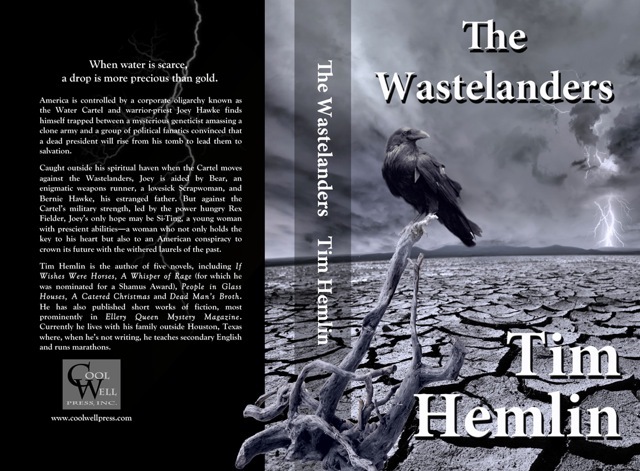 This book will be available across all eBook platforms as well as in trade paperback. To see an announcement about the book, click here. Stan Goldberg will launch his new book LEANING INTO SHARP POINTS: PRACTICAL GUIDANCE AND NURTURING SUPPORT FOR CAREGIVERS at Book Passage in Corte Madera on Saturday, March 10th at 7 p.m. The book launch is open to the public, and we encourage all to come. Kimberley will be present, and I may stop by after finishing the Mills College Pitch Fest. We hope to see you there! Kimberley Makes A Two-Book Deal! Publishers Marketplace announced Kimberley's latest two-book deal with Jim Frenkel of Tor yesterday in the Fiction/Sci-Fi/Fantasy category for publication in 2013. This was a long-awaited deal in which she sold world rights to James Gunn's TRANSCENDENTAL, a search across the galaxy with a crew of both humans and aliens (much like the pilgrims in The Canterbury Tales) for a machine that promises real Transcendence. The second book in the deal is STARBRIDGE, which was co-authored with the late Jack Williamson. 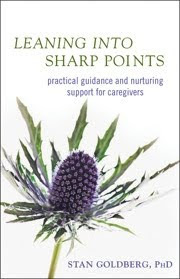 Kerry Weber reviewed LEANING INTO SHARP POINTS: PRACTICAL GUIDANCE AND NURTURING SUPPORT FOR CAREGIVERS (New World Library) in her article "Books for Caregivers Offer Advice and Inspiration" for Publishers Weekly. Weber says of Goldberg's book, "The book has advice for both those providing ongoing caregiving and those handling surprise diagnoses that may lead to a rapid change in lifestyle." "A first-rate thriller! RUN TO GROUND delivers the goods: great characters, fine investigative details and the kind of nail-biting action that leaves you rapidly flipping the pages, breathless to discover what will happen next!" Mills College Pitch Fest 2012! On Saturday, March 10th, from 1:00 p.m. to 5:15 p.m., I'll be attending the Pitch Fest 2012 Writer's Conference at Mills College in Oakland, CA. 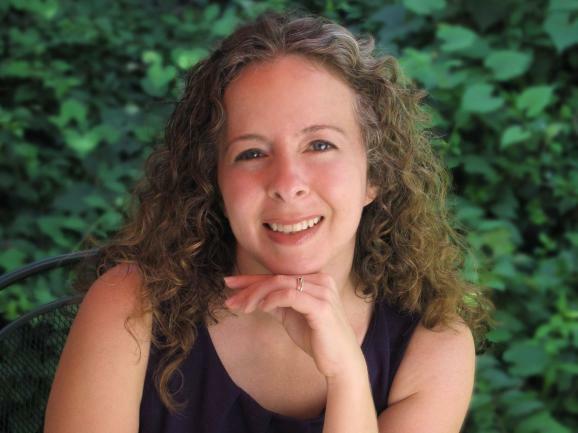 Kristina Miltenberger, the conference organizer, says the "one-day event is designed to connect writers with local Bay Area literary agents, publishers and MFA alumni, who are working in the Bay Area." For more information or to see a list of the panelists, click here. Italian Rights were sold for Laura Florand's THE CHOCOLATE THIEF to Leggere/Fanucci. According the the deal memo, Leggere/Fanucci won out over a competing publisher and has a marketing plan in place that includes boxes of chocolates in addition to online and physical marketing. Stan Goldberg's recently released book LEANING INTO SHARP POINTS: PRACTICAL GUIDANCE AND NURTURING SUPPORT FOR CAREGIVERS was reviewed by Anna Jedrziewski for Retailing Insight magazine. Jedrziewski says Goldberg has "organized the wisdom he's gained through decades of experience into seven compassionately written chapters...these chapters create a quick-reference "how-to" for navigating the choppy waters of caring for someone with a progressive illness." D.P. Lyle's book, FORENSICS AND FICTION: CLEVER, INTRIGUING AND DOWNRIGHT ODD QUESTIONS FROM CRIME WRITERS, received a fun review from author R.P. Dahlke. Dahlke says, "D.P. Lyle's forensic book should be in the library of every aspiring, as well as veteran, author." To read Dahlke's full review, click here. Kimberley's client, D.P. Lyle, sent us a link to a company by the name of Purple Papaya, which specializes in helping authors with social media platforms. We thought we'd pass along the link. In today's publishing climate, it's important for authors of both fiction and nonfiction to put focus on author branding and self or book promotion. In addition, for any published author (traditional, e-book or self-published), it's in your best interest to co-promote your work since 1) you may only have a publicist for a limited time 2) publishers will look at your past sales when considering your future works 3) you may secure a traditional publishing deal if your e-book or self-published sales are good, and 4) money is nice. Taking time to focus on the business side of writing is important. Check out Purple Papaya by clicking here. 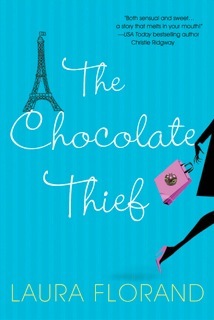 We received great news that Walmart Canada has placed an order for Laura Florand's THE CHOCOLATE THIEF. We have our fingers crossed that they'll do the same for the next two books in the chocolate series: THE CHOCOLATE KING and THE CHOCOLATE KISS (working titles). Good afternoon all - I just attended the San Francisco Writer's Conference last weekend. This is one of the best conferences in the country, and I was very pleased to moderate a panel and meet hundreds of writers. Many excellent agents and editors also attended the conference and participated in what was a great environment for opportunity. Publishing is changing and we are adapting to new paradigms, but the bottom line is, the deals are happening and there is always a need for great writers. So polish your skills and make your work the best it can be, and we'll be there to seriously consider and advise, to the best of our ability. Bon chance! One of our readers turned me on to this video, put together by two NY agents and an editor. It's a classic. 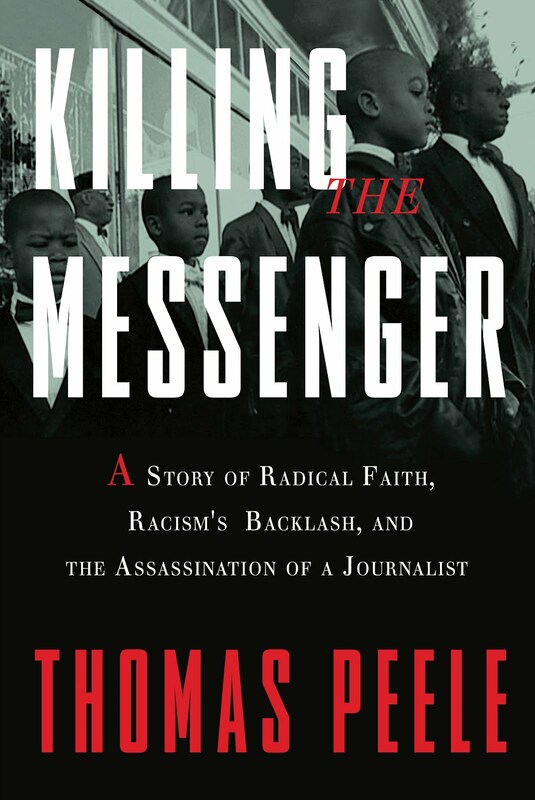 Thomas Peele, author of KILLING THE MESSENGER: A STORY OF RADICAL FAITH, RACISM'S BACKLASH, AND THE ASSASSINATION OF A JOURNALIST (Crown), will be in the San Francisco Bay Area for book signings and Q&As about his recently released book. "Killing the Messenger is a crackling work of nonfiction, impossible to put down. Like Krakauer's Under the Banner of Heaven, Thomas Peele unpacks a tale of extremism and evil..."
Kimberley made another two-book deal for Laura Florand, author of THE CHOCOLATE THIEF and BLAME IT ON PARIS, to continue the chocolate series, to Alicia Condon at Kensington for publication in 2013. The two books for publication are titled THE CHOCOLATE REBEL and THE CHOCOLATE KING. 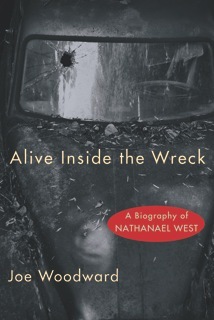 Jay Parini reviewed Joe Woodward's ALIVE INSIDE THE WRECK: A BIOGRAPHY OF NATHANAEL WEST for Literary Review magazine's February issue. The article is titled "California Nightmares." Parini says, "This is a remarkably good and succinct biography, well worth reading. It adds considerably to our understanding of West, taking on the fabled machinery of Hollywood itself, which often seems more of a troubled state of mind than an actual place or industry." To read Parini's full review, click here. 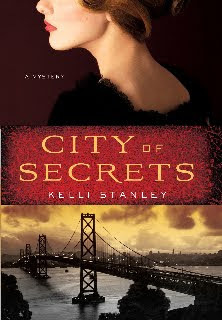 Kelli Stanley's book CITY OF SECRETS (Minotaur) has been nominated for The Golden Nugget Award for the "Best Mystery Novel Set in California." 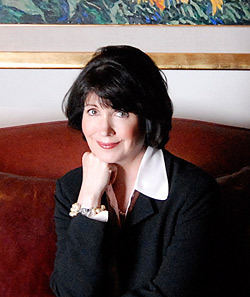 Kelli is in the company of Sue Grafton and Michael Connelly in the category, with winners for all categories to be announced at the 2012 Left Coast Crime Conference, which is being held in Sacramento, CA, March 29th through April 1st. Best of luck, Kelli, for yet another nomination. May that "best of luck" morph into award-winning congratulations! You sure deserve it. 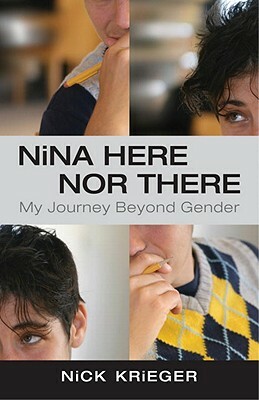 Nick Krieger was recognized with a 2012 Stonewall Book Award by the American Library Association (ALA) for his book NINA HERE NOR THERE: MY JOURNEY BEYOND GENDER. According to the ALA press release, "The Stonewall Book Awards are given annually to English-language works of exceptional merit relating to the gay, lesbian, bisexual and transgender experience." We offer a big congratulations to Nick Krieger for this significant award! Entertainment Writer Joe Meyers reviewed D.P. Lyle's book ROYAL PAINS: SICK RICH in his blog article "Royal Pains: A Winter Escape to the Hamptons." Lyle was contracted to write the ROYAL PAINS book tie-in series for the TV show Royal Pains. To read Meyers' review of the book and show, click here. I love this cover of Tim Hemlin's book THE WASTELANDERS and had to post it. Although my grandmother was not a big fan of ravens, I am. Tim's book was released by Cool Well Press this month and is available now as an e-book through Kindle. Kimberley said it took her about three years to sell Tim's book, which just shows her dedication to projects she believes in. "When water is scarce, a drop is more precious than gold. America is controlled by a corporate oligarchy known as the Water Cartel and warrior-priest Joey Hawke finds himself trapped between a mysterious geneticist amassing a clone army and a group of political fanatics convinced that a dead president will rise from his tomb to lead them to salvation. Caught outside his spiritual haven when the Cartel moves against the Wastelanders, Joey is aided by Bear, an enigmatic weapons runner, a lovesick Scrapwoman, and Bernie Hawke, his estranged father. But against the Cartel’s military strength, led by the power hungry Rex Fielder, Joey’s only hope may be Si-Ting, a young woman with prescient abilities––a woman who not only holds the key to his heart but also to an American conspiracy to crown its future with the withered laurels of the past." 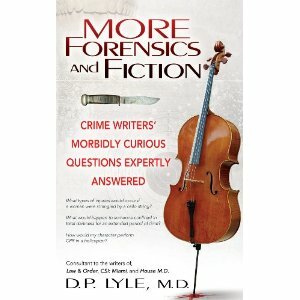 Doug Lyle's MORE FORENSICS AND FICTION: CRIME WRITERS' MORBIDLY CURIOUS QUESTIONS EXPERTLY ANSWERED was reviewed on Women In Crime Ink, a blog of "thoughts on crime and media issues from women criminal justice professionals and authors." Doug Lyle's book will be released by Medallion Press in April 2012. To read the review of MORE FORENSICS AND FICTION, click here. On Thursday, January 19th at 1 p.m. PST, Doug Lyle will be interviewed on Blog Talk Radio. For a link to the interview, click here. The call in number for the interview is: 949-270-5955. A launch party for Joe Woodward's book ALIVE INSIDE THE WRECK: A BIOGRAPHY OF NATHANAEL WEST was held at the LA Press Club in collaboration with O/R Books recently. The crowd was welcomed by Diana Ljungaeus, Executive Director of the Los Angeles Press Club, and Joe was then introduced by Boris Dralyuk, Noir Editor at the Los Angeles Review of Books (LARB). Also at the event were Evan Kindley, Managing Editor (LARB); Julie Cline, Senior Non-Fiction Editor (LARB); Stephanie Swengel, Vice President of Production, Fox Animation Studios, and many others. Joe Woodward is a four-time finalist and two-time winner of a Los Angeles Press Club Award. His nonfiction, on some of the most reclusive, eccentric, yet talented writers of our time, including David Foster Wallace, Bret Easton Ellis, Tobias Wolff, and Hunter S. Thompson, has appeared in a variety of publications.